Nearly half the country’s main building contractors and a quarter of building specialists saw falls in output in the last quarter of the year. The sharp decline in fortunes at the end of last year was revealed in the latest industry-wide trade survey compiled by the Construction Products Association. Reports of a sharp slowdown came as the latest Government figures for the end of last year confirmed construction output fell 0.3% in the fourth quarter. In December alone construction shrank 2.8%, with both new work, and repair and maintenance contracting in this period. For the whole of 2018 construction output only edged up 0.7% – the lowest annual growth since 2012. According to the CPA survey output, new orders and enquiries were reported lower by main building contractors, specialist contractors and civil engineering contractors in the last three months of last year. 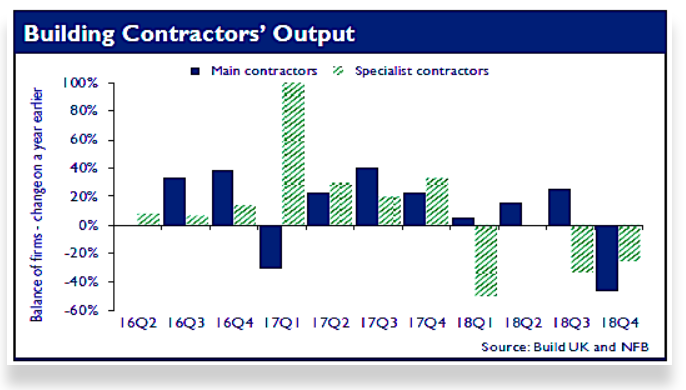 Furthermore profit margins fell for 13% of main contractors and 40% of specialist contractors in Q4. But in a mixed picture for the supply chain, 55% of heavy side manufacturers and 21% of light side manufacturers reported growth, with 25% of SME builders also on balance reporting increased in workloads. Main contractors’ order books for all new build sectors were reported to be lower in Q4, whereas order books for housing R&M were reported to have increased compared to the previous quarter. Rebecca Larkin, senior economist at the CPA, said: “Parts of the construction supply chain have clearly started to feel the effects of the falls in new orders since the EU referendum translating into reduced activity in sectors such as high-end residential, commercial offices and industrial factories. 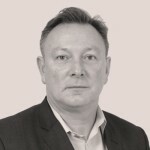 “The uncertainty that precludes investment decisions in these sectors with a high upfront outlay may also be benefiting other areas of the supply chain. Brian Berry, chief executive of the Federation of Master Builders, said: “Mounting Brexit uncertainty is starting to have a tangible effect and the indicators are not good with almost half of builders reporting signs of a weakening housing market. “Furthermore, a worrying one in five construction SMEs has had projects stalled in the past three months due to delays to loans, or loan refusals, from the banks.